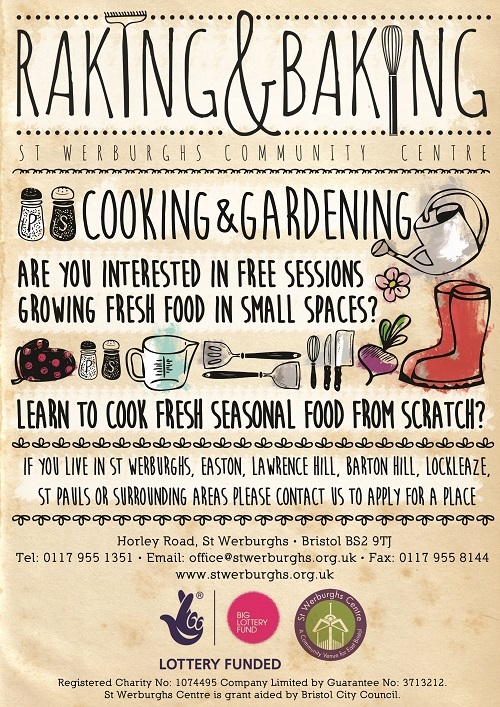 This course is run at St Werburghs Community Centre. Raking and Baking is funded by the Lottery via the Reaching Communities, Big Lottery Fund. Courses run for 8 weeks from 10am – 3pm. This course is free and available to anyone! The morning cooking sessions focus on how to cook fresh, healthy and well-balanced meals using seasonal home-grown organic fruit and veg. Participants also learn how to use surplus harvest to last all year by making chutneys, cordials and jams. The gardening sessions teach how to grow fruit and vegetables in pots on windowsills, in containers and on allotments. There will be workshops on how to sow seeds, take cuttings, look after mini-crops, how to harvest them and cook them. In addition, there will be lessons on planting flowers which are decorative, beneficial to wildlife or edible. By Foot - We are located in St Werburghs by M32. From the City Centre follow the walking route along the river Frome, which begins by Staples near Cabot Circus. At the Junction 3 on M32 take the underpass towards St Werburghs and carry on by the other side of the motorway to Mina Road. The Community Centre is signposted from there. It is a pleasant walk and takes approximately 30 minutes. For more walking routes and estimated walking time from wherever you are please see the directions and map here. By Bus – Services run close by the Centre up Sevier Street/York Street/St James Street. The No 5 linking the City Centre from Ruppert Street (near Bus Station opposite Primark) to Emersons Green. Also, 48/49 service on Stapleton Road/ Warwick Road. Short walk across the bridge over the M32. By Bicycle – Cycling Route number 8 passes just south of the centre on the other side of the motorway, so access to the Centre from the route is available via the footbridge or by the Junction 3 underpass. We have secure bike parking facilities on site with CCTV coverage. By Rail – the closest station is Stapleton Road Railway which provides services hourly to Gloucester and Westbury and provides a local service (the Severn Beach Line) between Bristol Temple Meads and Avonmouth. By Car – Both from the city centre and from outside Bristol the area as a whole is easily accessed via the M32 Junction 3. In Bristol links north to Montpelier/St Andrews, Horfield and Filton are accessible via Ashley Hill or Muller Road and links south are easily accessible through St Phillip’s Causeway.